Membership in our squads is by invitation from the coaches followed by a trial session or two. There are several competitive groups arranged by level of competition and the pathway the gymnast is following. South Durham's competent team of coaches work tirelessly to ensure the groups achieve maximum impact in the training time available. Our elite squad members are normally selected at an early age, based on proven criteria as gymnasts most likely to succeed to a high level in competitive gymnastics. Membership in the squad requires a strong commitment from both parent and gymnast with passion and desire for the sport a fundamental requirement. The girls train in the gym 15-25 hours per week, with supplemental flexibility and conditioning programmes tailored for each individual. Squad members may compete at regional, national and international level. We have advanced groups for those gymnasts that will ultimately be competing in the regional grades. These are new levels designed to bridge the gap between Intermediate and Elite gymnastics. 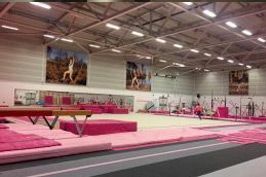 The girls train 3 times per week, in an intense programme to enable the gymnasts to reach their maximum potential within the region. We have intermediate groups for all ages. These gymnasts compete in club, county and north levels. While the training programme for these groups is less intense than elite and advanced groups, with the girls training twice per week, the squads remain hugely successful and have an envious reputation throughout the region. This newly created squad is for gymnasts primarily selected from recreational classes who show competitive potential. These gymnasts train twice per week and compete in Pink Events and other selected competitions. Sessions are friendly and fun with the added bonus of competitive opportunities. Our mini squad gymnasts are the stars of the future! The squad is for 4-6 year old girls that have been identified as having desire and potential to succeed in women's artistic gymnastics. The squad trains 2 1/2 hours per week, focusing on the progressive development of gymnastics basics, flexibility and conditioning which will underpin the above levels when they are ready to move on. The mini development squad is for young gymnasts of 3-5 year olds who show possible potential to move into one of our higher level squads when they reach an older age. The squad train once a week for 1 hour with the option of also doing an extra recreational class during the week. The squad aims to develop the basic skills needed for gymnastics as well as building confidence on all pieces of apparatus. The aim of all these groups is to foster passion and commitment in the sport with enjoyment a paramount consideration. This is demonstrated through the number of former competitive members becoming coaches and judges as they continue their involvement in the sport, influencing future generations.